Vitis Vinifera Awards – Awards, driven by the consumer. Awards, driven by the consumer. 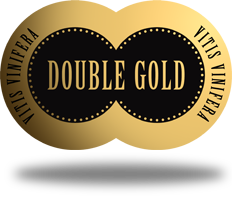 The Vitis Vinifera Awards recognise quality wines and grape derived spirits available to the majority of consumers. Most other competitions focus on aspirational products in the ultra-premium segment of the market, enhancing the perception that good products are out of reach of the average consumer. This in turn leads to the misconception that appreciating wine and grape based spirits is an elitist matter, reserved for a small group of connoisseurs who are able to describe subtle flavours in obscure language. Many fine wines and spirits are produced across a range of taste spectra and price points. 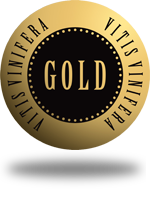 With the Vitis Vinifera Awards, we aim to commend wines and spirits of quality, making them available to consumers on more shelves across the globe, and confer awards on superior products across price categories. Red wine flights will alternate white wine flights where possible in order to prevent tannin build-up. No more than 10 products of a particular class will be tasted consecutively where possible to prevent flavour saturation. All panellists will be lovers of grape derived products like wine and spirits. These are the exact members of the public who will spend their time and money in the winelands whenever they can, and spend it most often on wine and spirits. Panels will be comprised of qualified consumers who possess at least a Cape Wine Academy certificate, or a similar qualification. We are sensitive to gender and age equity in our judging roster and try to staff each panel with judges who have professional diversity and experience. Judges may ask for a new bottle to be poured if they believe a product to be faulty or corked. A product will be disqualified if the second bottle is found to be faulty. Entries will be judged randomly, but in order of vintage where necessary. The panel chair will assign a different tasting order to each judge (e.g. from low numbers to high or vice versa) in order to minimise the shadow effect within a flight. Tasters will judge each product on an overall basis. Products will be presented to the judges in numbered glasses. No sample bottles will be visible to the judges at any time. The judges will have no knowledge of the identity of the products, except for the minimum information needed to score. Staff members will be instructed to avoid discussing any brand names entered into the competition. This process of judging is referred to as double blind and uses concepts found in Wines: Their Sensory Evaluation by Amerine and Roessler (1983), and aims to avoid some problems often associated with blind tasting. The pouring area will be totally off-limits to the judges. Red wine flights will alternate with white wine flights where possible in order to prevent tannin build-up. Whenever possible, no more than 10 products of a particular class will be tasted consecutively to prevent flavour saturation. There will be morning and afternoon tasting sessions where necessary. Flights are structured so no panellist has to judge only one type of product during the tasting event. Panels will typically be expected to judge about 90 products per day, rarely more. There will be a 20-minute mid-morning break given to the judges where tea, coffee and sandwiches will be provided. In order to prevent tannin build-up. In order to prevent flavour saturation. To ensure an even spread of tasting opportunities. Products will be awarded Gold and Double Gold awards, and the Top 10 producers will be able to add the Top 10 Producer sticker to their entries as well. How much does it cost to enter a product? 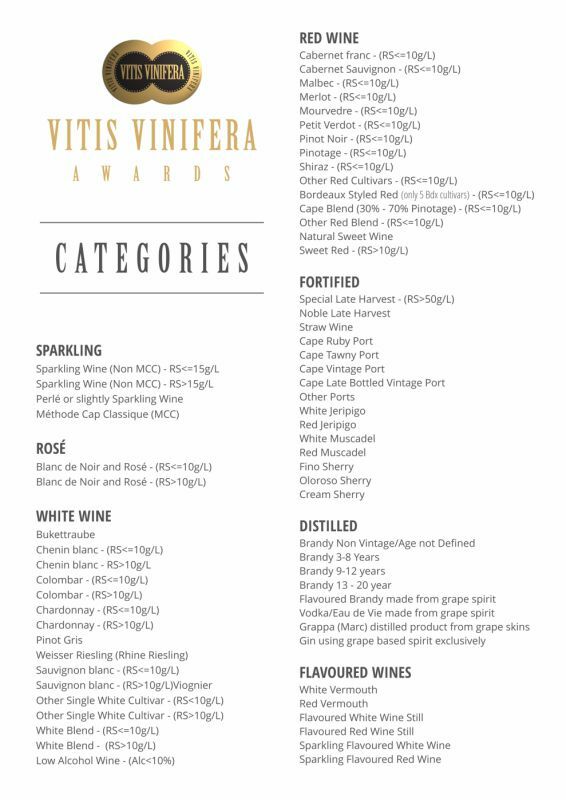 The Vitis Vinifera Awards is one of the most affordable competitions. The cost is R750 excl VAT per entry. Gold, Double Gold and Top 10 producer stickers will be available at R370 excl VAT per 1000. Do I get a certificate if my wine has won an award? An electronic certificate will be sent by email to the winners. If the exact same product is sold under different brand names, you can request a certificate for each brand at no extra cost. Results will be emailed to entrants on or before 9th September 2019 to notify them. The entrants can utilise the stickers and competition artwork to maximise exposure on various social media fronts and for their existing client base, but must display them together with the name(s) of the product and vintage if applicable, that earned this accolade. Stickers will focus attention on the award-winning products, leading to higher visibility and a boost in sales. When will the stickers be available? We will endeavour to have the stickers ready for collection around 23rd September to 27th September 2019. The stickers have to be paid for prior to collection, unless other arrangements are made with the organisers. Do I have to order stickers? What happens to the samples that is left over after tasting? Any remaining samples at the end of the judging process becomes the property of Vitis Vinifera Awards. The tasting procedure will be audited by a reputable auditing firm to ensure the judges are not influenced and the tasting is done blind and conforms to international standards. Spirits have to be 100% grape based to qualify for entry. All wines from outside South Africa do not need a WSR2 or WSR4 certificate. All non-flavoured wines from South Africa must be accompanied by a SAWIS (South African Wine Industry Information & Systems – www.sawis.co.za) application number, and the stickers awarded may only be applied to the wine attached to the application number. If a certain wine has more than one application number, the wines must be entered separately. Each non-flavoured wine from South Africa has to have a current WSR2 or WSR4 certificate showing that the wine was approved on the strength of taste and analysis by SAWIS, or a Department of Agriculture Wine-on-Line screen capture printout to show the wine has a current tasting date. This certificate must be current (i.e. the wine must have been tasted and approved by the board no more than one year before 4th September 2019 in the case of a white wine and 18 months in the case of a red wine). A sample will not be accepted without this certificate. No refunds will be paid if the WSR2 or WSR4 certificate is not current. There is no limit to the number of entries per producer. However, each flavoured wine or spirit may only be entered once into the competition (even if it is under a different label), and any participant may enter more than one wine, flavoured wine or spirit in a class. Examples are wineries that produce several wines of the same varietal type but with different vineyard designations or vintages. Entries and registration will be accepted online from 23rd April up to midnight on 27th August 2019. Proof of payment must be emailed to support@vitisawards.com before midnight on the closing date for entries to be accepted. For wines in 750ml bottles, a sample has to comprise three bottles per entry. For wines in containers bigger than 750ml, a sample has to comprise two units. For wines in containers smaller than 750ml, a sample has to comprise four units. For flavoured wine or spirits, a minimum number of two 750ml bottles is required, or the equivalent thereof. The samples must be delivered to the drop-off point in Stellenbosch, South Africa between 9:00 and 16:00 on the 2nd or 3rd September 2019 to be accepted into the competition. Winners will be notified by email, and stickers will be available for collection about two weeks later. Proof of payment of both the entries (R750 excl VAT per entry) and stickers is needed before stickers can be collected. Gold, Double Gold and Top 10 Producer stickers cost R370 excl VAT per 1000, and come in multiples of 1000 and 2000. By entering the competition, the entrant commits to paying for the number of stickers indicated before the required deadline (11:00 Monday 9th September 2019) for the products that receive awards. 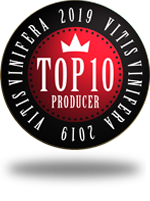 The winners of the Top 10 Producer Award may put this sticker on all wines entered. The producer may only use the Gold and Double Gold stickers awarded on the particular product that was entered and won the award. Stickers may not be put onto another batch of product similar to the one entered, that did not win an award in this year’s competition. Participants must always market their winning products in conjunction with the year of the competition the product won the award. Any samples remaining at the conclusion of the judging become the property of the competition. If a participant does not follow all the rules of the competition or legal requirements as required by SAWIS for South African wine, the competition has the right to disqualify the particular entry concerned or the entire year’s entries, or ban the producer from the competition. For confidentiality purposes, only a list of the top producers may be made public. There will be no list of all the producers that took part in the competition or the score assigned to any product. Employees of the competition and their immediate family are not allowed to enter the competition. In the event that for any reason possible the judging cannot take place, or entrants cannot be given results, half of the entrants’ entry fee will be refunded, and no other damages will be awarded to the competition, or any of the companies involved. For any claim to be made against The Awards Show (Pty) Ltd for defective stickers, the stickers must be returned to Postnet at Stellenbosch, South Africa within 7 days after the date of delivery to Postnet. The Awards Show (Pty) Ltd will within its discretion either replace or pass a credit for defective stickers so proven, but shall not be liable for any direct, indirect, or any other loss, including loss to third parties and legal expenses, arising out of errors in providing stickers, or by delay in delivery, or by unsuitability of goods for use intended. This competition can change the rules of the competition without notice, and publish them on the website without giving notice to entrants. If the entrant does not want to comply with the new rules of the competition, they can cancel their entries up to the date entries close. After this time, entrants have to comply with the rules of the competition. When you enter the main gate at Nietvoorbij, go through the security boom and drive up the road all the way until you reach the white walls at the top. You then turn left towards the Experimental Cellar and drive past the stairs on the right. Keep driving around the building, and to the right you will see the entrance to the back door of the cellar where the wine must be delivered. Michelle’s contact details are michelle@turnkeyeventsolutions.com , 082 773 0738. Nietvoorbij Experimental Cellar, Nietvoorbij, Klapmuts Road (R44), Stellenbosch; Attention: Michelle.